Are you looking for a guaranteed showstopper? These oversized danglies won't disappoint for you. Ornate and sophisticated, they’re on our shoping-list when we’re dressing to impress in a hurry. Badgley Mischka's designs have a jewel-centric and often Victorian aesthetic; they tend to meld ornate motifs with an "old money" quality that stops short of being too, too ostentatious. Combing old world elegance with modern glam which gives these Badgley Mischka Gold Lace Dangle Earrings a dazzling and attention grabbing look. Pair with your perfectly white shirt or full skirt for a sophisticated look or wear with shorts and a blouse. 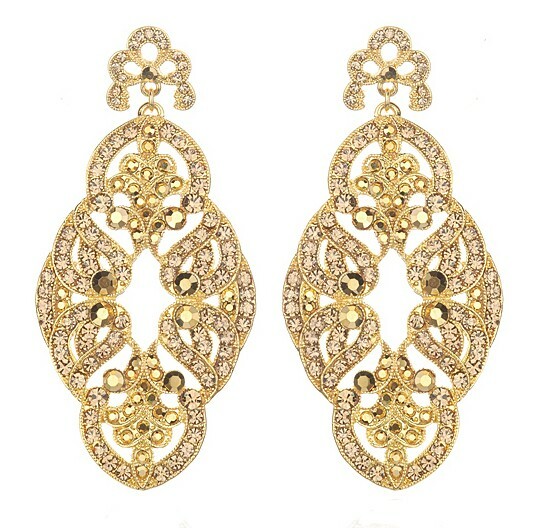 Featured in gold(plated), they are adorned in sand colored glass rhinestones. On the bright and sunny day, Badgley Mischka's Gold Lace Earrings would be sparkle so beautifully. They measure at 3 inches long and 1.5 inches wide. The price is for $250. Buy danglers earrings online at Rockrush.com.